Wouldn’t it be nice if the bulls would cooperate? I hear it every year. 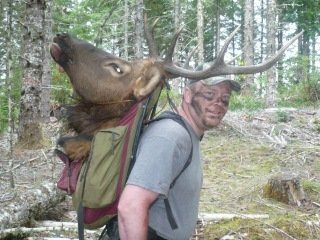 Friends and hunting acquaintances ask what the trick is to calling in bulls. It’s really simple: find an elk that believes what he hears and have lots of tricks up your sleeve. Do you bugle or cow call? It has a lot to do with what the elk are doing when we find them, or what they respond to, or even what our mood is, or how we spooked a herd yesterday. Sounds complicated, but it’s also very simple. Find a bull that believes what he hears, and call him in. Why all the give and take? First of all you have to do everything right and find the right situation. This means find elk that buy into your calling, then setup close and downwind in a steady wind situation. That is the basic setup for success, and then individual situations start to play out. This year we had two almost opposite experiences with herd bulls, and upon some reflection I have figured out what likely happened in both cases. We camped near where we planned to hunt the next morning to save hours of driving and stay flexible with the herds we find. One night after dinner, a bull bugled several hundred yards away. Several minutes later when we bugled to try to pin down his location, he not only bugled back but started coming our way with quite a bit of aggression! He ended up 60 yards from camp, destroying small trees and grunting amazing reverberating grunts. Talk about exciting, he was showing us who was boss! After quite a show he faded back to his original location and another bull started in bugling close to us. The next morning we called in the herd bull in about 2 minutes of calling. One call would have done it. Unfortunately the bull came across the wide open and stopped at the wrong angle, coming in between me and the caller. Thirty yards away for fifteen seconds STRAIGHT DOWNWIND! The bull smelled me and trotted away. In this situation it was clear that the bull was being harassed by a satellite bull and was quick to give chase. When a bull is fed up with a satellite bull, the setup is a surefire success for a chance at shooting a bull. The second situation involved a vocal bull that we were on four different days. Once we ran out of daylight and twice we got into the perfect setup, within 100 yards of a bugling bull downwind with a steady breeze. One time the bull got worked up to our cow calling. We had already noticed he would pull back from bugling. After bugling and grunts he and the cow(s) pulled back into the timber in a systematic retreat. 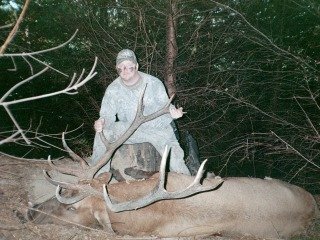 This bull would retreat into the timber and even further into the timber if pushed. What was the difference? Very likely he had not been harassed by smaller bulls. Possibly there were one or more bigger bulls in the area and this bull was taking no chances losing his small harem (we only saw one cow). It’s also possible the elk had run into another hunting party or two and wised up, not to mention the four days we spent chasing him. So the insight is, every situation is different and the hunters can only piece together a certain amount and then try to make the best hunt possible. The individual personality of each bull, as well as what is going on with the herd, satellites bulls and cows, will make each setup fail or succeed. Do it over and over until it works. 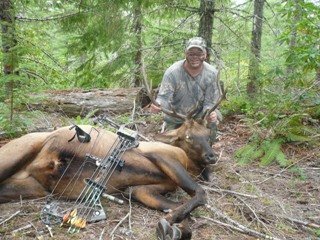 Believe in it, put in the time and effort to find elk, and hunt relentlessly with the expectation of success!